MAN T200 is the latest original diagnostic tool from MAN that replaces old MAN CATS II diagnostic tool. Designed for maintenance of trucks, buses and other heavy vehicles made by MAN, it supports older and new models of vehicles due to the support of various diagnostic protocols. MAN T200 supports a very wide range of MAN vehicles due to compatibility with older vehicle models and old diagnostic protocols and due to compatibility with vehicles equipped with CAN BUS diagnostic system. This tool works with original MAN diagnostic software MAN CATS II (version 14.01). T200 helps you to maintain almost all MAN vehicles and engines at your workshop or outside anywhere on the road in case of emergency. Suitable for large MAN services and small workshops. T200 comes in a kit with necessary cables, notebook PC and original MAN diagnostic software (installed on PC). Truck diagnostic tool MAN Cats T200 by Teradyne is the newest 2017 year scanner designed for MAN trucks and other vehicles with MAN engines. It works well with any newer MAN vehicle due to its capability to support CAN type diagnostic programs. Here lies the main advantage over MAN Cats II, which can only support the older trucks (no support of CAN systems). On the other hand, T200 supports both newest and older vehicles’ systems and protocols. 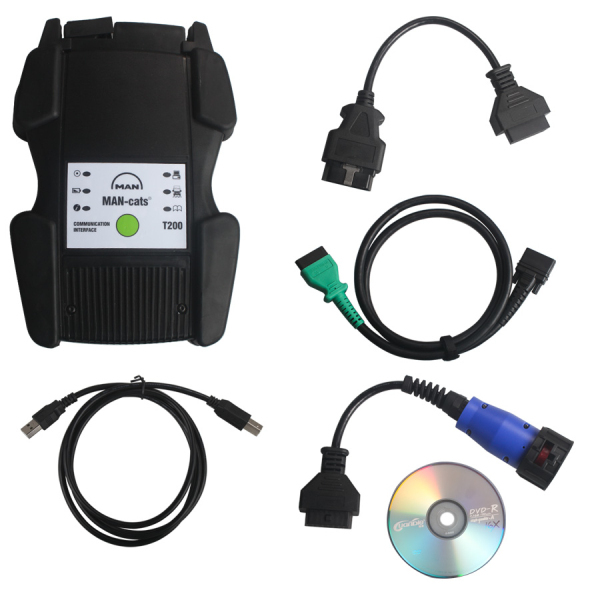 This truck diagnostic tool is an ideal assistant for any type of MAN services, professional dealers or local mechanics.